To a greater extent than makes us sensitive humans comfortable, we rely on cliches--or at least tropes--to understand the world. Humans create culture. 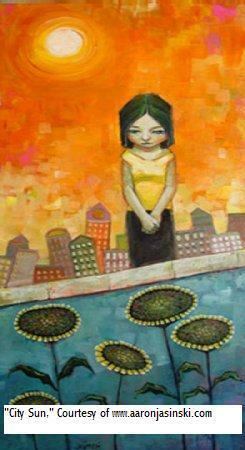 Culture creates repetitive behavior. Recognizing that repetitive behavior brings people together either to protest or laugh. One of my favorite examples of tropes being used for laughter occurs in the first season of Leverage. 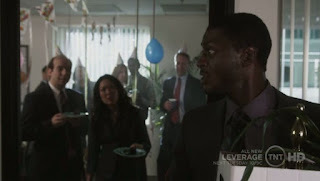 In a single episode, "The Mile High Job," Hardison (Aldis Hodge) enters a workplace (with fish), starts break-room gossip, holds a meeting full of pointless jargon, has a birthday party, and gets fired. It's utterly hilarious because it is so entirely recognizable. The break-room gossip? About video games and who likes whom. The meeting with pointless jargon? A PowerPoint with a graph and Hardison proclaiming growth for the next year. The birthday party? Hats and cake--what else? The firing? Hardison stands in the hallway yelling at an invisible boss while carrying a box of "personal" items. "Oh, I always liked him," says one employee as he leaves. He has been working at the place less than 8 hours. Meanwhile, the audience nods and sighs and says, "Been there! Done that!"